Standing in for meat, these heart-healthy eggplant 'steaks' are packed with flavor and antioxidants making them an excellent choice for Meatless Monday. 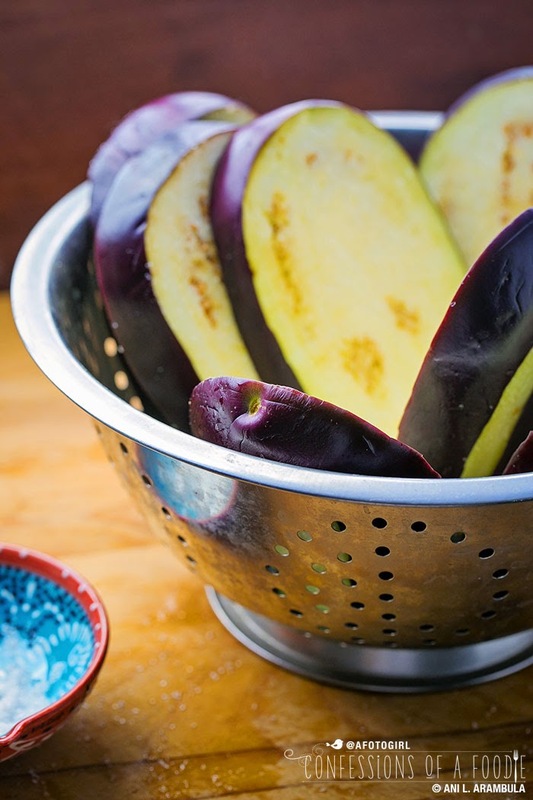 Though available year-round, heart-heatlhy eggplant is at its best when in season which is now through October. Standing in for meat, these satisfying eggplant 'steaks' are packed with flavor and antioxidants making them a healthy and delicious Meatless Monday meal in under 45 minutes. With that passing thought, I was lost in memories of my childhood. Examining it now through the filter of adulthood, it’s easier to understand the force that is my father. Growing up, I was both in awe and in fear of him. But with like most people, once you start to peel back the protective layers, you are able to see so much more. Dad worked very hard doing physically taxing jobs in order to support his ever-growing family. For most of my childhood, he was a carpet layer, then later a machinist. A work ethic like I’ve never seen since, I hardly ever remember him calling in sick no matter how ill he might have been. Mental health days? Unheard of. Most of the jobs he had didn't have sick leave. So whether it was waking up at 4am to go to work or coming home at 4am from work, he bore his responsibilities better than I could have at his age. By the time he was 25 years old, he had a wife, a mortgage and three daughters 5 and under to take care of (with two more daughters to come while in his 30s). My childhood is a study in contrasts. Dad had a child-like zest for pranks: there were summer days he would come home from work, walk through the door, hands in pockets waiting for us girls to run up and greet him and before the first of us reached him, out would come his hands holding two fully filled water guns and we’d get squirted all the while laughing and squealing in delight while running away from him as he chased us around the living and dinning rooms, through the kitchen, down the hall and back again. My mother, as we ran past her, would in turn, hand us plastic tumblers half-filled with water for us to get Daddy back, never mind that the water left puddles everywhere, which she would be left to mop up. Other days, he would come home so tired and incredibly cranky, wanting nothing but to be left alone to watch the news while waiting for dinner. We knew on those days that we had to remain as quiet as possible, tip-toeing around, using only our “inside” voices. As for dinner, 75 percent of the time, meat was the centerpiece, just as Dad liked it. A meal wasn't really a meal if it didn't have meat. Red meat, usually. Considering how expensive meat is now and how expensive it had to have been back then, especially buying enough to feed a family of five, and later, seven, I’m in awe of how my parent’s managed. Most manual labor jobs don’t pay nearly as well as desk jobs tend to pay. But they managed. Better than I could have. Pepper steak. Hamburgers with huge steak fries. Corned beef hash with tons of potatoes and eggs. Meatloaf and mashed potatoes. Carne asada with freshly made tortillas. Hamburger Helper with Rice-a-roni, These were the midweek meals of my childhood. And during the leaner times, it was sometimes breakfast for dinner or freshly made frijoles de olla (a big pot of pinto beans), rice and homemade flour tortillas. No matter how lean work was for my father, we never missed a meal. We never knew that there was a financial reason behind breakfast for dinner. We only knew that dad was home from work and dinner was at 5. There would be time enough to learn how hard providing for a family really was. Back then, it was simply more important for my parents to let us have a childhood of full bellies and great memories of surprise water gun attacks. Until next time, friends. Happy Meatless Monday. 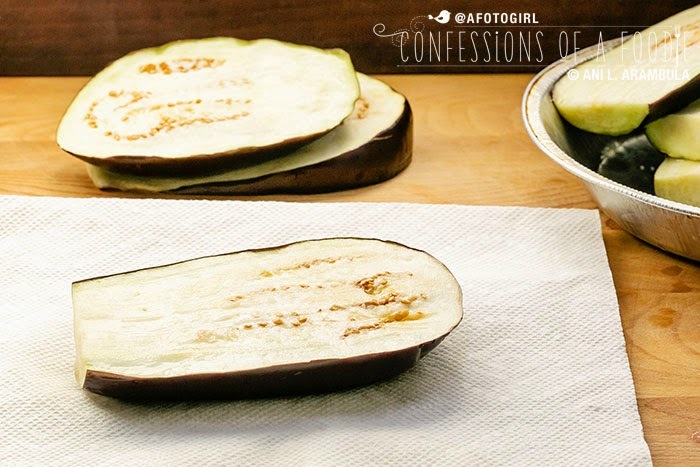 Inspired by a video I saw on Martha Stewart’s website, this eggplant is cooked to just golden brown and just barely fork tender so that they retain their firmness, giving them a more “meaty” quality. For this reason, don’t skip the sweating step. The salt will draw out any bitterness, leaving you with a better tasting steak. 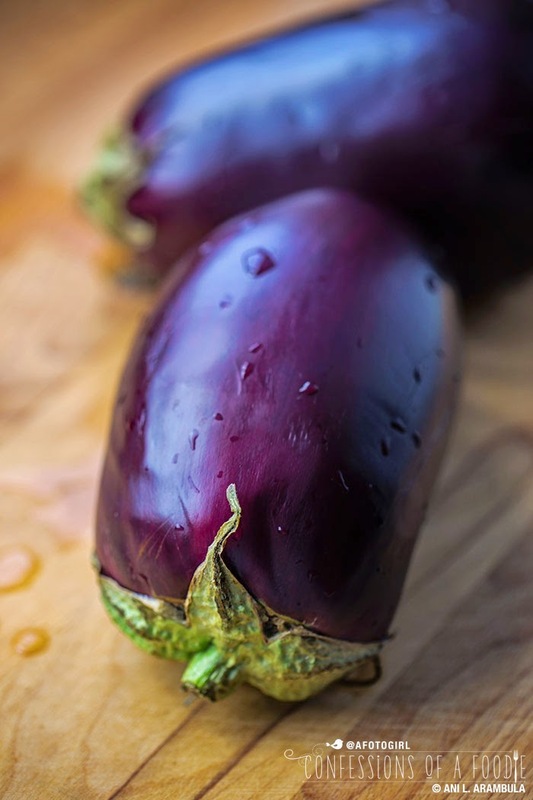 Sweating also helps to keep the eggplant from absorbing some of the oil. As for the skin, leave it on; it's filled with nutrients including fiber. I’ve tweaked the ingredients ever so slightly, first leaving out the flouring stage to keep the carb count down (be sure to pat the steaks dry VERY well before dipping in egg), then including Trader Joe's Parmesan/Romano blend in my breading (to help slow down the absorption of carbohydrates from the breading while also adding a big punch of flavor) and switching from regular panko bread crumbs to a whole wheat panko which has a slower glycemic load. Feel free to skip the pan frying and instead, spray the steaks with a little olive oil and roast them in a 400 degree oven for 8-10 minutes or until desired doneness, flipping them halfway through cooking. Since my low carb eating plan allows for heart healthy fats in moderation, I have no problem with the occasional shallow pan frying. Added bonus: This is an inexpensive dinner for a party of eight paired with the addition of grilled asparagus and finished with a low carb dessert, like my Skinny Brownies. This recipe can easily be halved. 1. Wash and dry eggplant. Cut the top, stem part, off. Cut a an ⅛ to a ¼ off the bottom. Stand the eggplant up, newly sliced bottom down. 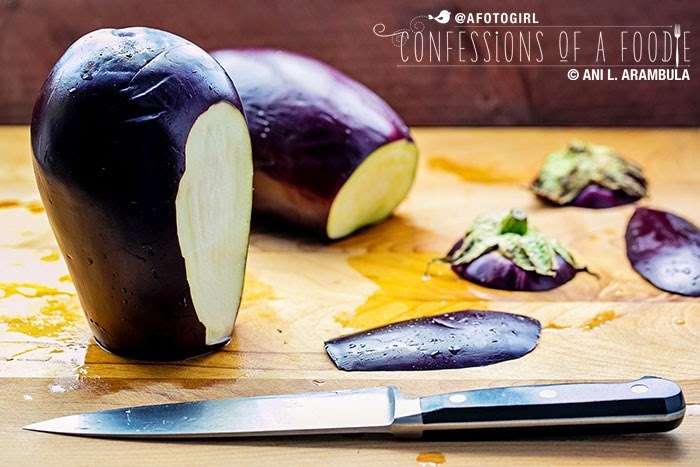 Thinly slice off some skin on one side of the eggplant, exposing some flesh; repeat on the opposite side (this will allow the egg and breading to have something to adhere to). Starting at the top, diagonal to the exposed flesh, slice the eggplant into for equal "steaks" (about an inch thick). 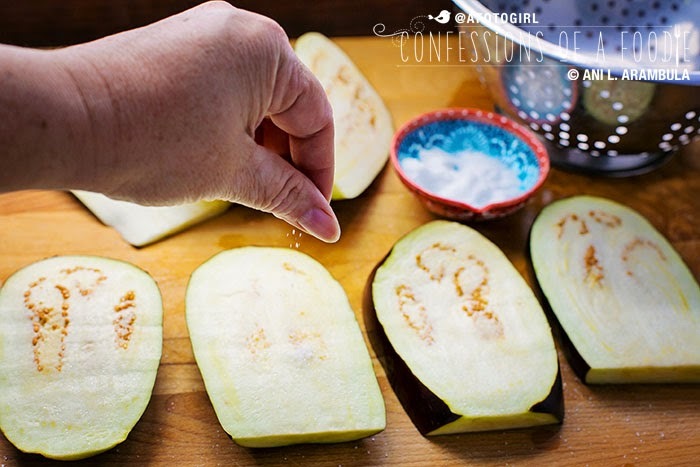 Lay eggplant on cutting board and generously salt both sides of every steak. Stand the steaks upright in a colander an allow to drain for 30 minutes. Repeat with second eggplant. 2. 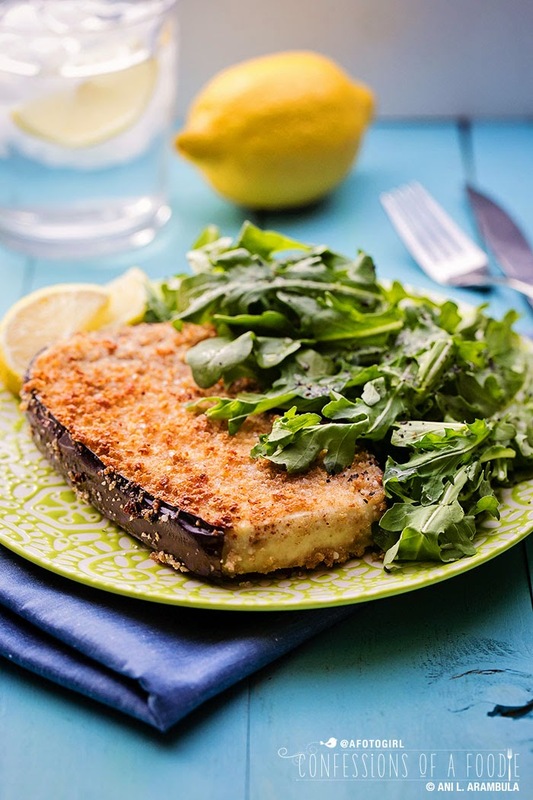 Measure out the cheese blend and Panko into a shallow dish large enough to accommodate an eggplant steak; set aside. 3. 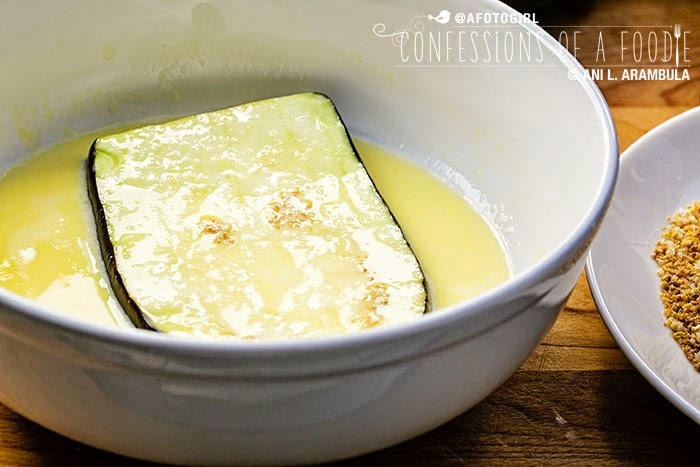 Crack an egg into a shallow dish large enough to accommodate an eggplant steak. Whisk in the yogurt until well incorporated; set aside. 4. 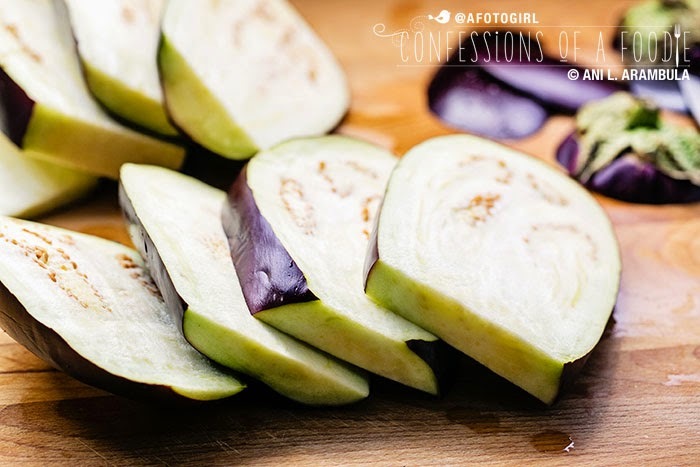 Rinse the eggplant steaks well, then dry completely, applying a little pressure to soak up any excess water in each slice. Dip a steak into the egg mixture, then hold it vertically over the bowl to allow excess egg to drip off; place the steak on the bread crumb mixture. 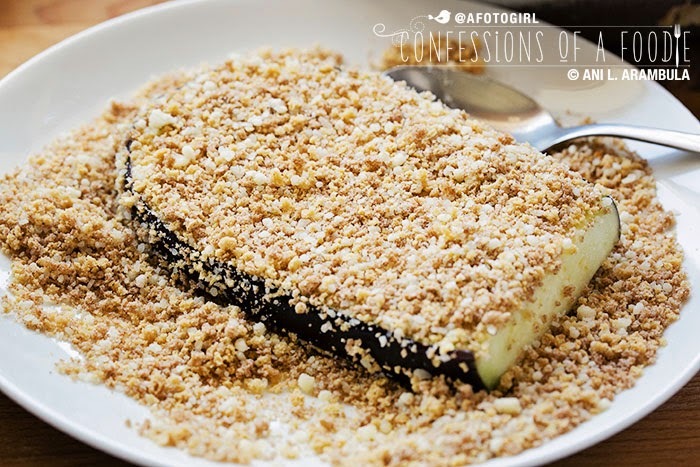 Using a tablespoon, cover the eggplant with bread crumbs then use the palm of your hand to press the eggplant into the bread crumbs. Flip steak and press the second side. 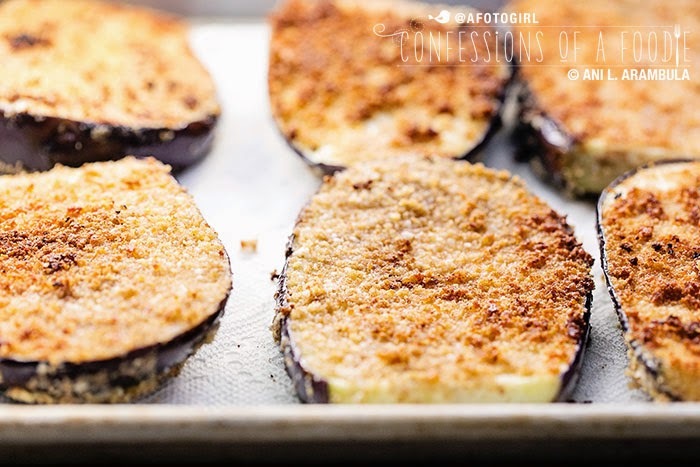 Place dredged eggplant onto a large plate or sheet pan. Repeat with remaining steaks. 5. Line a sheet pan or large platter with paper towels; set aside. 6. Pour ¼ cup of olive oil into a 10 inch wide frying pan and place on medium heat. Test the oil by submerging the handle of a wooden spoon or the thick part of a wooden chopstick into the oil. If it bubbles rapidly around the edges, oil is ready. Carefully slip in one steak, then a second steak. Fry until golder brown, approximately 5 minutes then use a spatula to carefully flip the steaks over and fry for additional 5 minutes or until golden. Remove to the towel lined pan to drain. Repeat with remaining eggplant, frying no more than two steaks at a time to keep the oil temperature from dropping. Add additional oil as needed. 6. Place a steak on a plate, add a cup of arugula partially covering the eggplant. 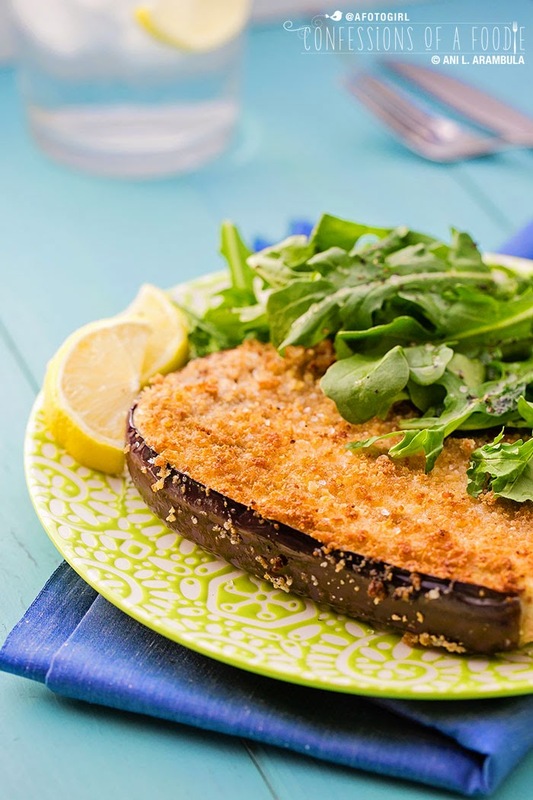 Squeeze a lemon quarter over the arugula and eggplant. Drizzle the greens with about ½ teaspoon of extra virgin olive and finish with a pinch of salt and freshly cracked pepper, to taste. Serve. 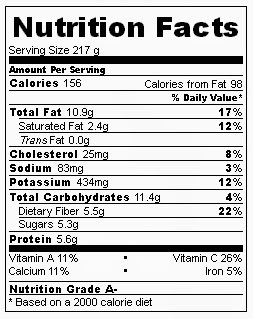 Note: Nutritional analysis is an approximation calculated using a free online tool. This was calculated for a single serving of one steak and 1 cup of salad. Brilliant! 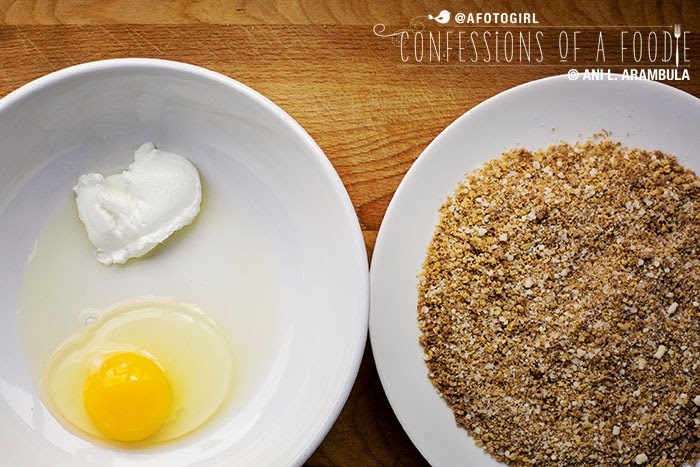 I usually coat with egg or milk, but love the idea of using yogurt. I'll be making this dish this week. I love coming across new and delicious ways to cook veggies! 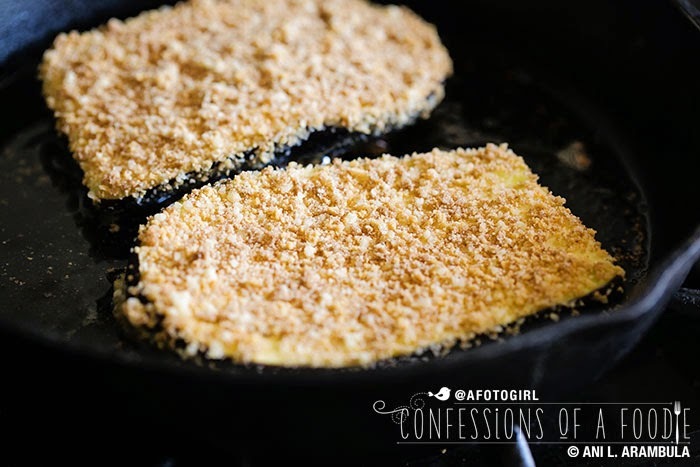 You definitely can consider I will be recreating these panko crusted eggplant steaks - they look and sound so tasty and are just perfect for me to recreate for my vegetarian family. Love this post, Ani! I've had a year-long battle with eggplant, since I a) generally hate it, and b) kept getting 2 or 3 in my CSA box all summer long! 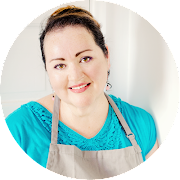 I found a handful of recipes I ended up enjoying, but man, the salting and "sweating" is the most important step! Your recipe looks delicious! 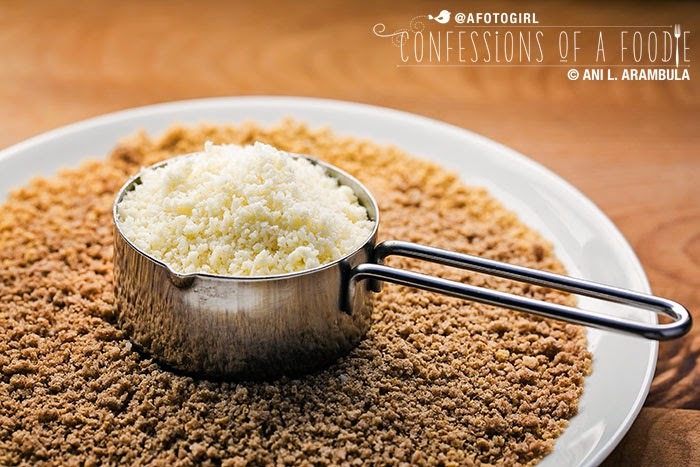 Where did you find whole wheat panko? Was it pricey?